Kyoto, Japan is full of rich culture and history. It was largely untouched during the World Wars, meaning many of the traditional architecture remains. If you are looking to experience the traditional styles and culture Japan is famous for, you’ll definitely want to check out the best shrines and temples in Kyoto! Most people use these words interchangeably (I did too for a while), but there are actually some differences between temples and shrines. I won’t be offended if you call a temple a shrine, or vice versa, but I think knowing the difference helps you better understand the culture around them and overall have a better experience during your visit. This is hands down my absolute favorite place and arguably one of the best shrines in Kyoto. Fushimi Inari sits atop a mountain, and is most popular for it’s various trails as well as the many torii (gates). In particular, it’s famous for its Senbon Torii, literally meaning “Thousand Gates.” It consists of two parallel trails that are lined with torii. As if 1,000 torii gates weren’t enough, it is said that there are over 10,000 torii gates spread across the shrine grounds (according to the Gaijin Pot blog). As somebody who has always been incredibly fascinated by torii gates, it’s not surprising that Fushimi Inari is by far my favorite temple in all of Japan. I went during Golden Week (several holidays all fall within the same week so many companies and schools have off), which is one of the most popular travel times in Japan. For that reason, it was incredibly crowded when I went. You have no idea how long I had to wait to get the above picture without people in it. However, I’ve heard it’s not very crowded during other times of the year. You could also consider visiting at night when there are fewer people. It also should be noted that the climb to the top of the mountain is a long one. I wore a kimono on the day I visited Fushimi Inari, and climbing the mountain in geta (traditional Japanese shoes) was quite difficult. If you intend on climbing to the top, make sure to set aside plenty of time and wear good clothing. Even if you don’t go all the way to the top, there are several places to eat and buy souvenirs along the paths. Kinkakuji, also known as the Golden Pavilion, is arguably one of the most famous and best temples in Kyoto. It is particularly famous for being covered in gold leaf. It sits on the edge of a pond, which often allows you to see a stunning reflection of the temple on the water. The gardens around the temple are also quite beautiful. The path takes you around the pond, eventually leading you right up to the temple. Beyond the temple are beautiful gardens, which include statues you can throw money at for good luck and a teahouse. Kiyomizu-dera, which literally means “Pure Water Temple,” rivals Kinkakuji for being the most famous temple in Kyoto. It was declared a World Heritage Site by the United Nations Educational, Scientific, and Cultural Organization (UNESCO), which aims to promote the preservation and growth of the world’s intellectual and cultural property. One of the most famous spots in Kiyomizu-dera is the wooden stage (part of the main hall). It stretches out over the hillside, allowing you to get a great view of the grounds below and the city in the distance. Also on the temple grounds are Jishu Shrine and the Otowa Waterfall. Activities at these locations bring various types of good fortune. At the Jishu Shrine, walking from one stone to the other with your eyes closed will bring you luck in finding love. Using another person to guide you from one stone to the other will still bring you luck, but means you’ll need an intermediary to help you find it. The Otowa Waterfall has three different streams of water. Each stream brings a different fortune. From the perspective of the drinker, the right stream is for luck in love. The middle stream is for longevity and the left stream is for wisdom or academic success. Know that drinking from all three is considered greedy and is considered to cancel the effect. The grounds for Daigoji are quite large, giving you lots to explore. 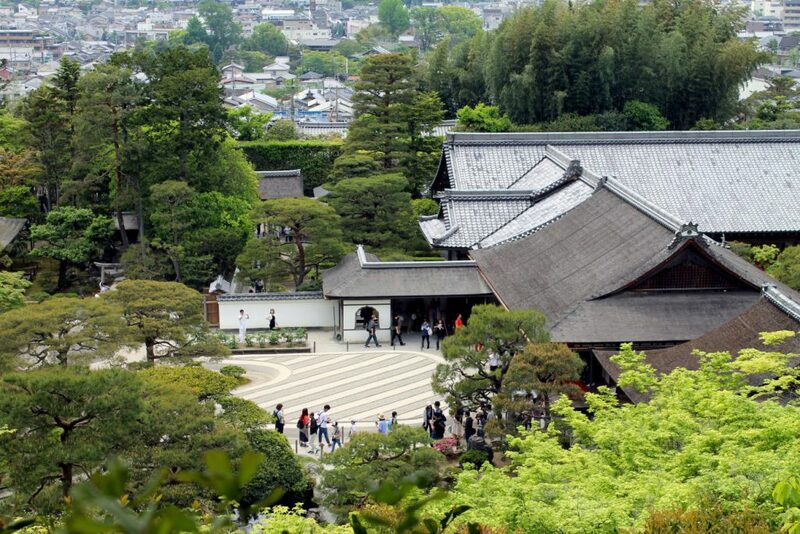 It is divided into the “lower grounds” and “upper grounds.” The lower grounds contain Sanboin (the former residence of the head priest), Shimo Daigo (contains the main hall and other important buildings), and Reihokan Museum (the temple treasure house). The upper grounds contain Kami Daigo (the original temple grounds). This temple was originally a retirement villa for a previous Shogun, or ruler of Japan, and was modeled after Kinkakuji. However, it is not plated in silver (as the name might suggest). After he passed away, it was converted into a temple. On the grounds, there is also a sand garden, moss garden, and even a small bamboo forest. Daitokuji is actually a collection of 22 temples. 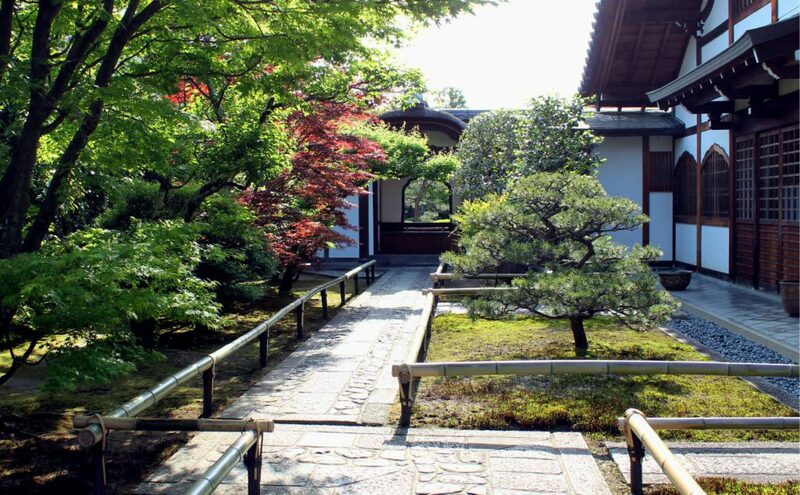 It is incredibly convenient in that you can experience all sorts of zen temples and gardens in one particular area. Unfortunately, only four of these temples are consistently open to the public. Other temples open at irregular or special times. Unfortunately, you have to pay separately for each of the temples you want to visit. However, if you are particularly interested in Japanese gardens, especially stone gardens, it is well worth the visit. Plus, they are not nearly as popular as some of the other shrines and temples in Kyoto, so even if you visit Kyoto during crowded times, you likely won’t find too many people here. More information about the individual temples at Daitokuji can be found on the Inside Kyoto website. Shorenin was originally built as living quarters for members of the royal family, but over time was turned into a temple. 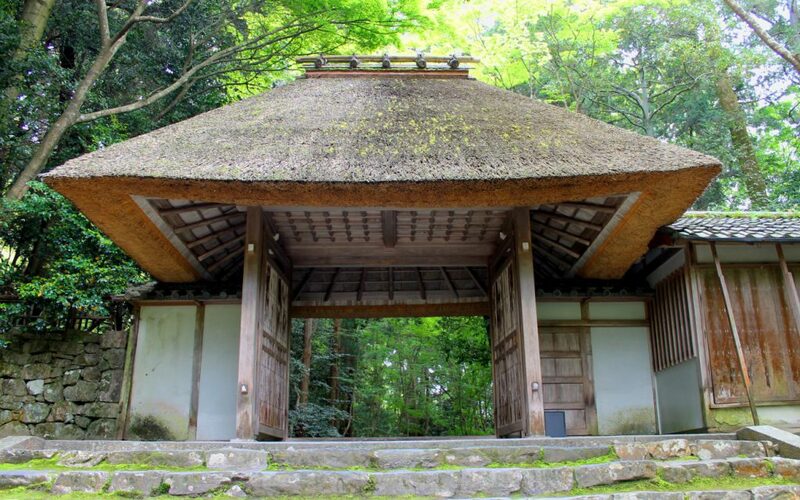 Unlike other temples in Kyoto, Japan, Shorenin is open to be explored, allowing you to wander through the many rooms, across tatami mats and through shoji, the sliding paper doors. Many of the rooms have paintings and other unique artifacts. The grounds also have extensive gardens, which you can admire from inside Shorenin drawing room, or while taking a stroll along one of the many paths. Byodo-in Temple is known for it’s unique architecture. The most famous part is Phoenix Hall, named for the shape and the two phoenix statues that sit on the roof. It is even featured on the back of the 10 yen coin. The temple itself sits on a small pond. There is a dirt path that leads you around the pond, allowing you to fully appreciate the temple. At the beginning of the path, you can get a guided tour (in Japanese) for an extra 300 yen. If you continue along the path, you’ll be able to explore the beautiful temple gardens. 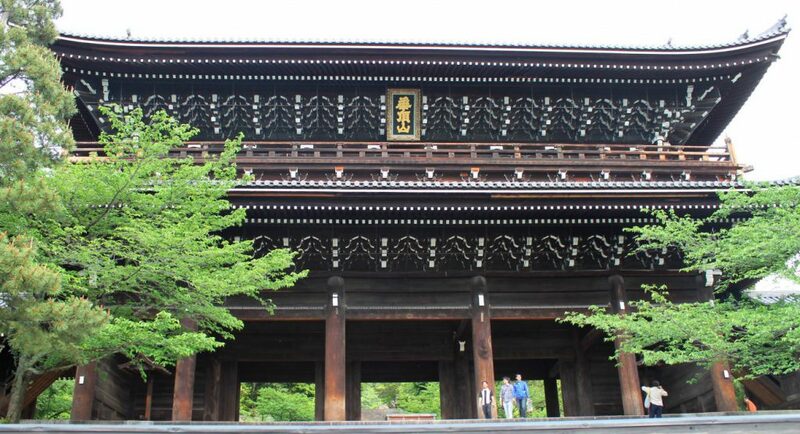 When you enter the temple grounds, you will pass through the Sanmon Gate (pictured above), which is the largest wooden gate in Japan. After walking through the gate, you will come across several halls dedicated to the priest Honen, who founded the Jodo sect of Buddhism. 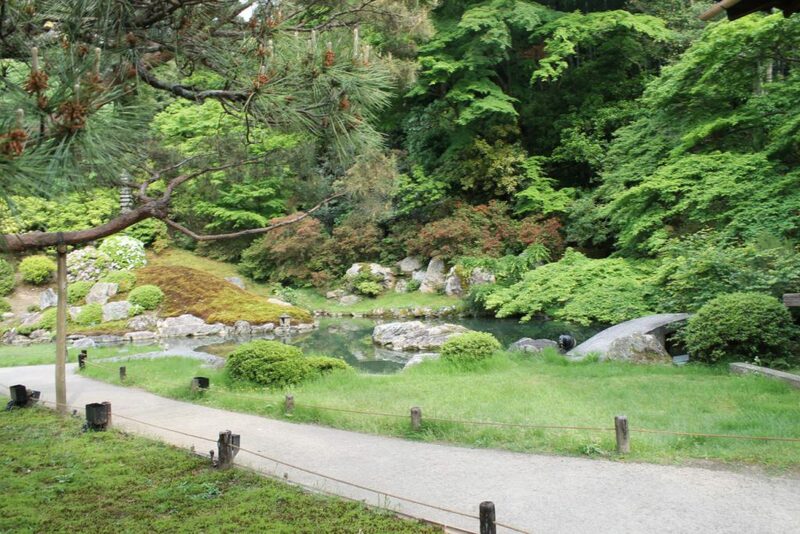 Also on the grounds are the traditional Japanese garden, Hojo Garden, and the more modern garden, Yuzen Garden. While Honen-in may not be as popular as some other temples and shrines in Kyoto, it made the list because of the nature that fills the grounds. Inside you can find moss gardens, sand sculptures and more. The vast number of trees and overall greenery that fills the temple grounds make you feel as if you have stepped into another world. Are there any shrines and temples in Kyoto you think I missed? Have you ever been to the shrines and temples listed above? Let me know in the comments below! Looking for more than just shrines and temples in Kyoto? Check out this Kyoto 4-day itinerary! Are you ready to start planning your trip to Kyoto, Japan? Plus, don’t forget to check and see if the Japan Rail Pass (JR Pass) is worth it for your trip! Japan is so high on my must-visit list I envy you. These temples look amazing! Here Tokyo and Osaka are all on my list! They’re all amazing places! I had the great opportunity to live in Tokyo for four months through an exchange program. I was able to spend a view days in Osaka, and I went to Kyoto on two different occasions because I loved it so much. What a great post! Love all these ideas. Especially Daigoji, it looks beautiful! Daigoji was one of my favorite and it amazes me that it isn’t more popular. Despite being an absolutely beautiful place and even an UNESCO world heritage site, when I went to visit, it wasn’t nearly as busy as other shrines and temples like Fushimi Inari and Kiyomizu-dera. Thanks for explaining the difference between a shrine and a temple! I’ve never been to a Japan but hope to visit in 2018 so this is helpful! Not a problem! I wish I had known the differences before I visited. I didn’t realize the difference until much further into my trip, and I feel like I would have appreciated the different aspects of each more if I had known the differences. I hope you enjoy your trip in 2018! How long are you thinking of going for? Do you know where you are planning to going in Japan? Thank you for explaining the difference between a shine and temple! I never knew! I was in Kyoto years ago and really enjoyed visiting, the day I was there it raining all day! I love to go back and see it on a sunny day. It stinks that it rained for the day. I lucked out in that it didn’t rain when I was in Kyoto, but it rained plenty of times when I was in Tokyo. I know how hard it is to navigate Japan with an umbrella. I was constantly worried about not banging my umbrella against other peoples’ umbrellas and had a hard time focusing on anything else going on around me, haha. 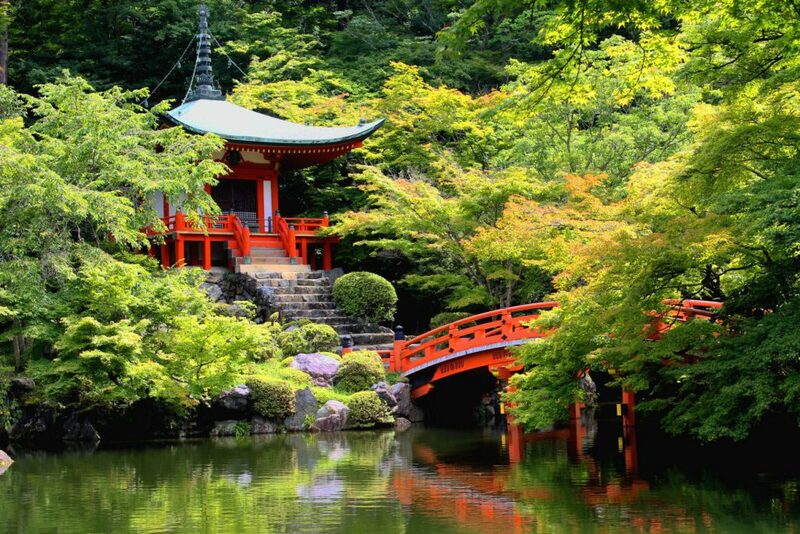 The temple and shire grounds in Kyoto look so serene and peaceful. I would love to visit Daigoji. And Kinkakuji also looks beautiful. I absolutely loved them. If you are looking to experience the “zen” atmosphere Japan is often known for, these are great places to start! They are all beautiful! I had no idea what the difference was between a shrine & a temple so thank you for clearing that up! 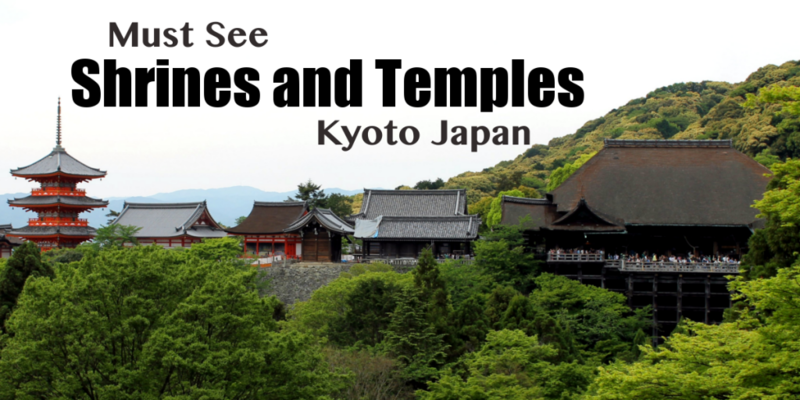 I visited a few shrines & temples in Tokyo but would love to go to Kyoto! Tokyo has some really great shrines as well! I also had the pleasure of visiting a few of the shrines in that area, but after visiting Kyoto, I’d have to say that the shrines and temples in Tokyo pale in comparison to the ones in Kyoto. Thanks for such an informative post! I never quite knew the exact differences between the two so this clears things up. Beautiful photos, by the way! Glad I could clear it up for you. They’re so similar it’s easy to mix them up, especially if you’re a foreigner from the West where Buddhism and Shintoism isn’t talked about nearly as much. First off, thank you for explaining the difference between a temple and a shrine, I never knew that. Japan is very high on my bucket list and one of the reasons are all the religious buildings. I’d love to visit the Daigoji and the Fushimi Inari! A friend of mine is currently in Japan and I’m so jealous of him 😀 Thank you for showing all those great temples and shrines. Not a problem! Japan was also number one on my bucketlist for a long time, and I had many friends who were able to go to Japan before me. They always came back with such amazing stories and pictures and I’d be so jealous. Don’t worry, your time will come! I love Kyoto! Would be glad to visit again soon! Loved everything about Kyoto, the food, the people, the Gion and the temples! A great post and first of all thanks for explaining the diff between temple and shrine. Even I used to think they are same. Japan is already high on our list. Now, the unique architecture, colors, and aura of these shrines and temples have increased our urge. Beautiful post. I spent a long time dreaming of visiting Japan, and the beautiful pictures of the traditional Japanese culture and the beautiful architecture and colors of shrines and temples were a great pull for me as well. While in Japan, much of my time was spent visiting the various shrines and temples not only in Kyoto, but all over the country because I thought they were just so beautiful and fascinating! This was super informative. I always see a few of these places in photos but don’t know too much about them. I would love to see them in person. I am going to have to make a trip to Japan. Trust me, they are way better in person! Glad I could teach you a little bit about them! 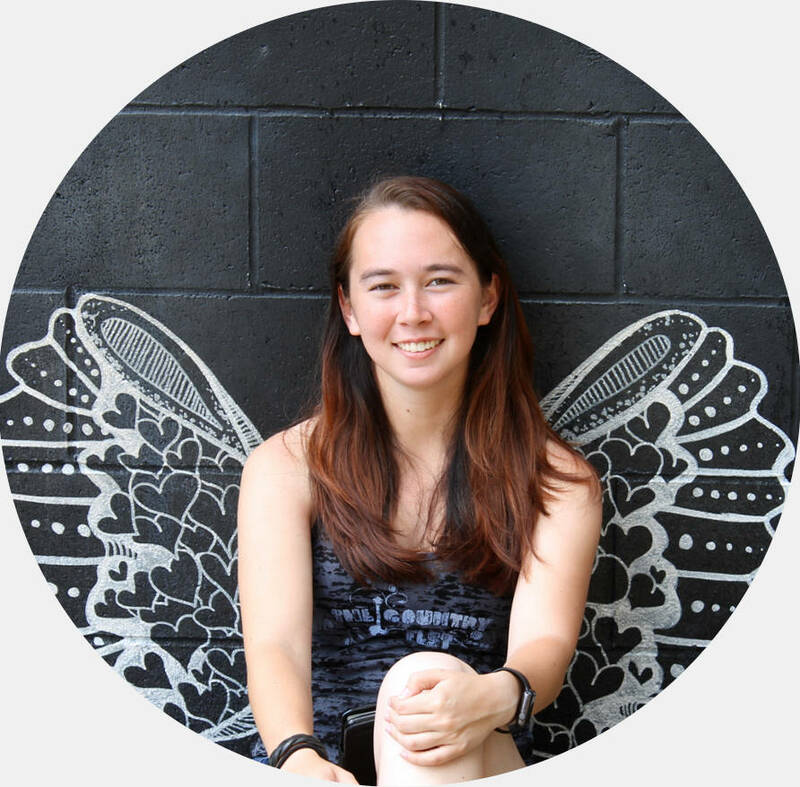 Greay post, I’ve always wanted to travel to Japan, this blog post will surely help me. Very informative, especially since I’ll be visiting Japan for a month next year and have no idea where to start with the planning! We planned our trip to avoid Golden week too since we heard it’s pretty busy. How long did it take for you to see all the temples and shrines? You can see Most of them in a day, because all of them are fairly close to each other. You can walk between most of them. I split it into two days mainly because I wanted to rent a kimono the one day and getting it on can be a process. Then of course it slows down your progress because it’s kind of restrictive and you can really only take small steps at a time. Personally, I think two days is better just so you don’t feel like your rushing from place to place. Plus, seeing them all at once can make them blur together and you start forgetting what cool things were at which temple. However, if you’re in a time crunch, I definitely think it can be done in a day. Japan is one of the next places I want to visit, your photos are great. Thanks, I’m so glad you liked them! Wow! What a great insight into the intricacy of temples and shrines in Japan. We love Japan and can’t wait to visit again. Thanks for sharing this. Glad you enjoyed it! I’m also planning another trip to Japan and am so excited to be going back. It’s just one of those places you can never really get enough of! I’ve been to both actually! My mom was with me in Hawaii, but not Japan, so I was so excited to show her the Byodo-in replica in Hawaii. It was a way for me to share a little bit of my experiences in Japan with her. Thanks for your explanation of the difference between shrines and temples. Your photos are stunning. Daigoji temple is my favourite. I love the bridge on the temple grounds! Its so picturesque, especially for us photographers! Just wish I could have visited in the fall when all the leaves were changing colors. Love this post! We love both – temples and shrines, and especially those in Japan. The architecture and design is so unique and elaborate. A visit to Daigoji has been on our Bucket List since we first saw a picture of it. Can’t wait to visit Japan and seek out these temples and shrines ourselves! Thanks for sharing on #WeekendWanderlust – we really enjoyed it! 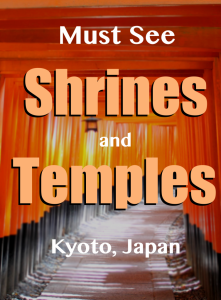 This is a great help for anyone serious about seeing the spiritual centers of Kyoto. I didn’t know the difference between Temples and Shrines before but feel a real kinship with Shintoism. Thanks for explaining the difference between a shrine and a temple. That is really helpful. I will be heading to Japan in a few months and can’t wait to visit a few of these. 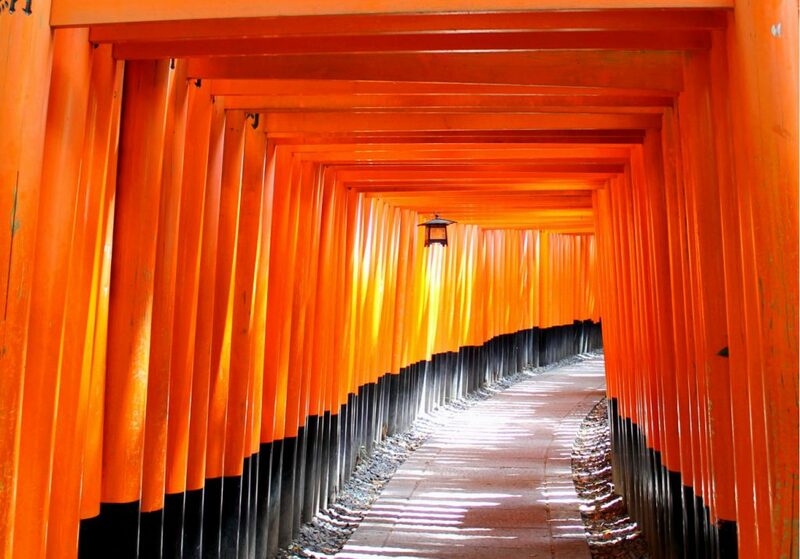 Especially Fushimi Inari! Fushimi Inari was definitely my favorite, probably because I’ve always thought the torii (shrine entrance gates) were so fascinating. Having a couple of thousand of them in one place definitely helped me get my fill of them! Japan is just about the only place I truly want to travel to. Thanks for sharing this fab list. I’ve added Fushimi Inari to my list. Glad to hear! Going to Japan was the first time I had traveled out of the country, and I had been dreaming of going there ever since I was a little girl. It’s so worth the visit!